I am so tired. What a weekend. 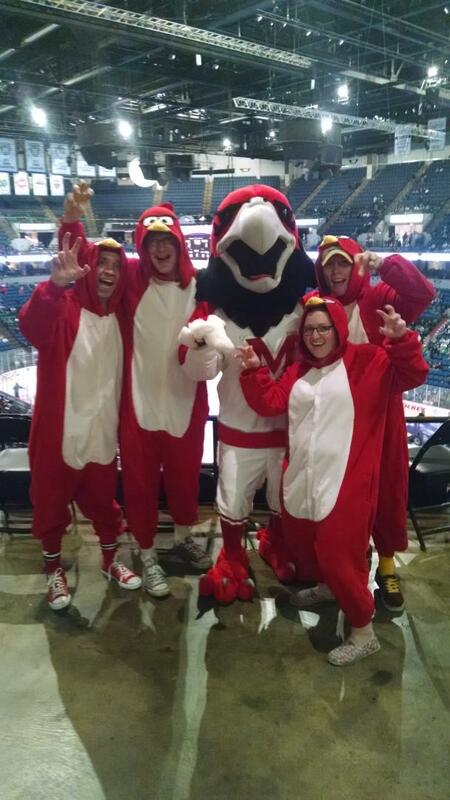 This may come as a surprise to many people, but it is completely possible and in fact probable that a fan can enjoy the NCHC tournament even if their own team is not there. And you don’t even have to wear a giant costume, although that helps. I recommend planning to attend well in advance, and then it’s an added bonus if your team is there! And also a burden because it’s much more stressful when the games actually mean something personally. tDogs have never played in the NCHC tournament and they stunk it up in the Final Five the last few years in the WCHA, so I have had to make the best of it without them lately. Friday afternoon’s game was decent, if only because I enjoy watching drunk sad pandas file out of the arena in droves. I also laughed pretty hard when St. Cloud scored to tie and then take the lead, all with under 25 seconds left in the period. Joey Benik’s goal with 5 seconds left in the period was fantastic. I actually cheered for St. Cloud, which pained me, but it would have pained me more to cheer for UND. 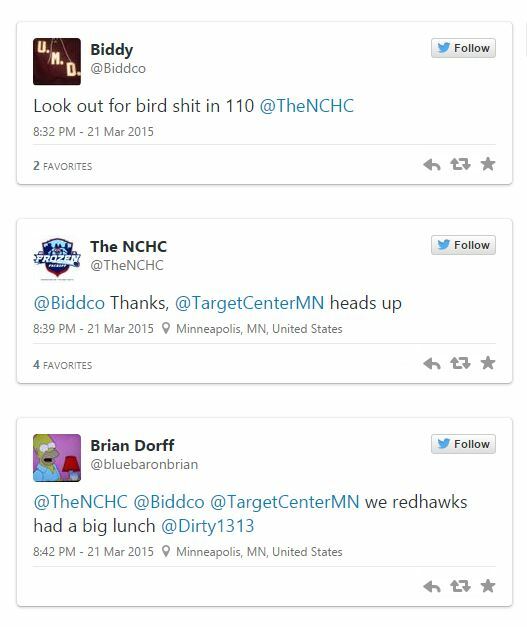 Also it ensured six NCHC teams made it into the NCAA tournament, which is hilarious. The NCHC did what the Big 10 thought they could do. Haw haw! Friday night’s game wasn’t exactly a marquee matchup, since Miami and DU brought about 11 fans between them. Miami did bring their band and mascot, which was outstanding. Since Miami didn’t have any fans, we decided we would give them our support. KAW! We KAWed at the Miami players during warm-ups, which they probably found very odd. Then we ended up on TV KAWing during one of Miami’s goals. Some of the game wasn’t very fun because this unbelievably drunk St. Cloud fan didn’t understand we weren’t really Miami fans and didn’t really care if he wanted to trash talk us. Biddco finally just KAWWWWed at him every time he tried to talk, like Dr. Evil. Some other St. Cloud fans stepped in and tried to shut him up, but then he wouldn’t leave them alone and security came and talked to him, but didn’t kick him out. He finally went away when I stopped being polite and started getting real. We also met the Miami mascot, Swoop. He seemed puzzled by our KAWing, even though we were speaking his language. I don’t know why KAW isn’t catching on. It should be sweeping the nation. During our strut around the upper deck looking for Swoop, Dirty used the water fountain to take a birdbath and I almost peed my bird onesie laughing. We changed into our costumes for the championship game and KAWWWWed ourselves silly. Some Miami fans (wearing Spandex suits) invited us down to join them. On our way there, we found St. Cloud’s mascot and Biddy “pecked” at his eye. He was admonished by security. We made our way down to meet the Miami fans, who were sitting on the glass (which is a horrible place to sit if you want to see the whole game). Dirty came down after us and told us that security was not going to let us sit in the seats. I don’t know why, we’d just gotten there. The Miami fans told us they had been harassed by security multiple times, had been forced to prove they had tickets for the seats they were in, and had been admonished for any number of petty offenses. Security came and got us after about four minutes. One of the security guards told me the league had told them we couldn’t sit there. Considering the league had had absolutely no time to respond to us getting into the seats, since we were not even in the seats before security told Dirty we couldn’t sit there, I knew this was a lie. This was a real black eye on the weekend for me. All four of us are “season ticket holders” for the tournament; two of us were from the fanbase that basically carries the weekend, and two of us were from a fanbase whose team wasn’t there, the type of fans who the NCHC should be courting. We weren’t swearing or fighting with anyone, we were cheering and adding to the atmosphere of the game, we were making friends with other fans, and overall having a good time. There was NO reason for security to come after us. The other black eye for the tournament is the eating/drinking contests they have. I don’t want to see someone chug pickle juice. Stop. 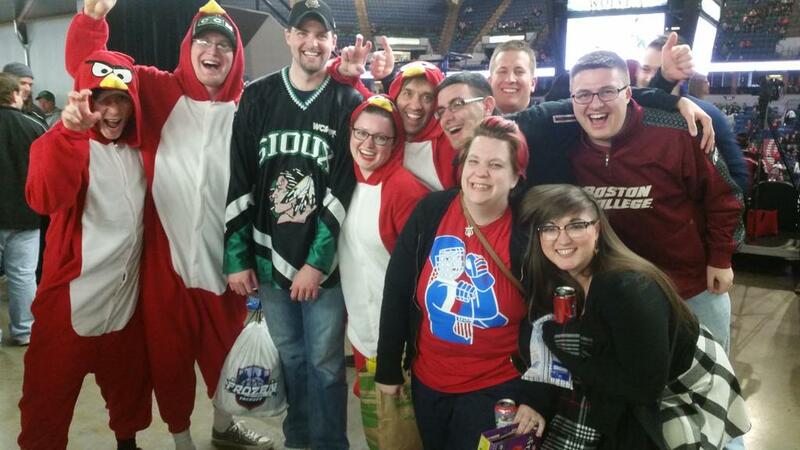 (edit) Folks from BC and Wisconsin were in town for the women’s Frozen Four and decided to come to the championship game. I was so excited to meet Nicole, freelancer extraordinaire and Bucky’s 5th Quarter contributer, Emily, a Badger fan, Jackie, who contributes to Goon’s blog, and Grant and Joe from BC Interruption. It was so cool to see fans from teams not even in the conference at the tournament. The weekend ended with Miami gooning its way to a championship. It’s not every day you see a hat trick (where ZERO HATS WERE THROWN ON THE ICE, GET IT TOGETHER MIAMI FANS) and a match penalty from the same player. Six NCHC teams will make it to the NCAA tournament, and tUMD will be sent to Manchester, home of Oasis; A Clockwork Orange’s author, Anthony Burgess; and JJ Thomson, discoverer of the electron. ‘Dogs fans are #ManchesterUnited! ← Whatever Happened to Saturday Night? Don’t look like no bulldogs to me. Well, there were no Bulldogs there!